Tired of sibling squabbles over toys, devices, and anything else they can think of? So was I—till I tried this mom-tested strategy that actually worked! Remember when you thought your kids would be best friends, sharing toys and learning from each other in harmony every day of their lives? If so, I bet you also remember the first time they fought over a toy (or piece of cake, or stool at the kitchen island, or, or, or…). The truth is, unless your kid is an only child, you’ve likely witnessed sibling squabbles every day of your parenting life. Older siblings will lose their cool when a younger sibling infringes on their territory. And that younger sibling knows just how to push the button that causes their older sib to lose it. Honestly, it left me fed up and exhausted. There are plenty of toys in the house—so why must they fight over that tiny plastic duck that no one cared about yesterday? Since my usual approach—lengthy lectures about the benefits of compromise—didn’t seem to be working, I asked my friend Cheryl Butler, aka Mighty Mommy, for advice. 1. In a conflict, no hurting (hitting, kicking, pinching, spitting) is ever allowed. If this happens, the consequence is no screen time for a week. 2. No name-calling or personal insults about someone’s physical appearance. Consequence same as in Rule #1. 3. If anyone is fighting over a toy, that toy goes into time-out. No questions asked. 4. Any person who demands to be first, will go last. *It’s a good idea to institute a borrowing protocol in which the child who borrows something from a sibling must put up collateral—a possession that will be returned only when the borrowed item is returned. (This is particularly effective once your kids have gadgets). Amazingly, once these rules were written down, they were harder for my kids to ignore—and even harder to argue with. So the next time a toy became the cause of World War III, I simply took it away and wordlessly pointed to Rule #3. It’s not my rule, kids—it’s the house rule. And it’s helped restore peace and sanity to our home. This article was written by Beata Santora from Real Simple and was legally licensed through the NewsCred publisher network. Please direct all licensing questions to legal@newscred.com. Siblings who fight a lot gain surprising advantages, from thicker skins to sharper negotiating skills. Plus, “Savvy parents know that a conflict-free relationship between siblings is not the same as a close-knit relationship,” writes Chicago Tribune parenting columnist Heidi Stevens. The goal is to have kids who love as hard as they battle. Here, four tips for raising lifelong best friends who share everything—including you. When parents handle conflict and anger with each other in a healthy, respectful way, they are modeling how their kids should face off. If you slam doors, hurl insults or, um, actual household items, it’s a safe bet they’ll mimic you the next time someone pushes their buttons. Added incentive to hit above the (emotional) belt? Kids cannot keep secrets. Ask anyone who’s died a little inside while her kid told the dentist how Mommy threw her egg sandwich at Daddy. A growing number of psychologists and educators swears by a conflict resolution method called Restorative Circles. You step in at the start of a fight and ask your kids to take a deep breath and sit down with you calmly in a circle. (Obviously, for screaming banshee fights, separation and soothing come first.) For just a few minutes, each child gets a chance to speak their grievance (You ask: “What do you want your brother to know?”), and the other child(ren) is asked to interpret what they’ve just heard (“What did you hear your sister saying?”). Then you go back to the first child (“Is that what you meant?”) until a mutual understanding is reached/all kids feel heard. Then everyone brainstorms ideas to find an agreeable solution. This article was from PureWow and was legally licensed through the NewsCred publisher network. Please direct all licensing questions to legal@newscred.com. From Jan Brady wailing “Marcia! Marcia! Marcia!” to the Pearson kids on This Is Us arguing over which member of the Big Three mom loved the most, sibling rivalry is a fact of life in any family with more than one kid. After all, who hasn’t felt like the wronged child—the one who always gets the earlier bedtime or the smaller scoop of mac & cheese? And no matter how careful you are to make sure your kids feel equally loved, one of them will inevitably bust out, “Not fair, you always take her side!” You may not be able to turn your household into one big harmonious sing-along, but here are some ways to keep the squabbling to a controlled minimum. Let them resolve their own fights. Help each child shine in her or her own way. When kids grow up in a house where everyone is encouraged to develop their own unique talents, they’re less likely to compare themselves to siblings—so don’t nudge Susie into playing soccer just because it will be easier than coordinating her hip-hop dance and flute lessons with her sister’s practice schedule. “You can help kids build self-esteem by getting them involved in activities where they feel happy and accomplished,” says Greenberg. In a large family, a child may feel lost in the crowd. That’s why Greenberg suggests having rituals you do one-on-one. It might be a regular outing (like a Saturday lunch after robotics class with Dad or a monthly mani-pedi trip with mom), or something simpler, such as a cup of tea together after school or a weekly trip to the library. This article was written by Lisa Lombardi from Real Simple and was legally licensed through the NewsCred publisher network. Please direct all licensing questions to legal@newscred.com. Siblings play a huge role in each other’s lives. Many siblings who are close in age become each other’s first friend. You can encourage a strong, long-term bond by letting your older child take care of his new brother or sister as much as possible. Children learn a lot from their parents, and they also learn a lot from their siblings. It is best to encourage our children to have strong connections with one another for them to achieve stable social and emotional development. When children are close with their siblings, the transition to making friends at school is much easier. With siblings who are farther apart in age, the older child becomes a teacher who can explain how to make friends at school and how to behave in the classroom. Along with being the first born, which is special in itself, your older child now has the extra special responsibility of being a role model for his little brother or sister. What are some ways you encourage your children to bond with one another? If your older child is acting out, she may be feeling less important than a younger sibling, who may have more needs—and require more of your time. While she may be verbal or even conversational at this point, she may not be developmentally able to express complicated feelings; she doesn’t realize why she’s acting out. Making sure that each child receives a fair share of your time can be a challenge! Squeezing in a few special moments or rewards for your older child can help to feel more important. If you have to run a quick errand (and someone is available to supervise the younger one), bring your older child along. A quick run to the post office can feel like a special adventure when it’s presented as special time together. Allow your older child to stay up a bit later—even it’s just 15 minutes. Save a special “big kid” activity just for this time such as a pop-up book, paper dolls or a special model truck. Offer to read an extra story before bedtime—just the two of you. While you are eagerly awaiting your new baby, your older child may be feeling a whole swirl of emotions—including feeling a little left out. So, in addition to preparing for the “newbie,” now is the time to reinforce your child’s sense of belonging. As basic as it may seem, take some extra time to reassure your child that they will have just as meaningful a place in the family after the new baby arrives—and in fact, even more so since they will now get to be a big brother/sister! Be prepared to talk about specific highlights and positive ways in which your child will be included, from helping to care for and be a protector of the new baby, to having someone to share the fun with, etc. If you have a sibling, share with your child some of your fun memories of growing up with a brother or sister. Be sure to involve your child in the preparations for the new baby—let him or her select the outfit the new sibling will come home in, help him or her to create something special to hang up in the new baby’s room—even let him or her pick the color of the baby’s room (from colors you’ve narrowed down, of course). Equally as important, be sure to make some extra special quality time for you and your child to bond—have a little picnic in the park, cuddle up for story time or bake up a batch of your child’s favorite cookies. Focus your attention only on him or her and steer clear of talk of the new baby during this quality time. Let your child know that these one-on-one get-togethers will continue even once the new baby has arrived—and be sure to follow through. Disagreements are inevitable in any relationship; the connection with siblings is no different. There are various types of conflict that can arise between siblings and they often stem from underlying feelings. Determining the root cause and addressing the feelings directly in these situations is best, instead of dealing with the matter at hand. The way parents handle these rivalries will ultimately shape the way their children treat each other. So, lead by example. By practicing a problem-solving approach, parents can use these situations as teachable moments in which conflict resolution and self-help skills are instilled. This will ultimately benefit their relationships throughout their life. 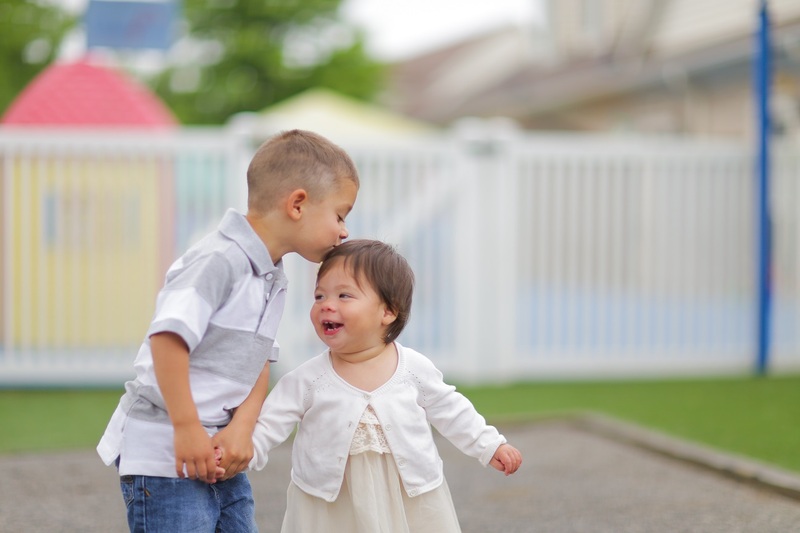 Below are common reasons siblings squabble along with some strategies to foster peace. A feeling of injustice may cause a child to act out if they are frustrated and believe they are being victimized. Instead of deciding who is at fault or punishing both children for fighting, try to accept and acknowledge each child’s viewpoint and help them to express their feelings to each other. Find resolution to the problem by having your children generate solutions of their own that they can agree on. Getting a great reaction from bugging a sibling out of boredom is sometimes all a child needs to create their own fun. In lieu of punishment or ignoring the problem, try to redirect the child’s attention by getting them involved in a fun activity or asking them to help you accomplish a chore or task. If a child feels like they are not receiving what they crave from a parent, their actions may be a ploy to get attention…positive or negative. Avoid giving negative attention in the form of punishment but be sure to recognize when you observe positive sibling interactions. Try to create more alone time with each child individually. This usually occurs when unproductive parenting strategies have been used. When parents attempt to stop arguments instead of teaching children to resolve their issues, the lesson of conflict management is lost. In this scenario, a likely reaction is for children to harbor resentment toward parents and their siblings. This sometimes manifests into constant revenge; siblings often look to slyly pick on each other when they think parents are not watching. Steer clear of labeling and comparisons as well as revoking privileges. As an alternative, encourage each child’s positive efforts you witness. Although this may not seem to be a worthy form of discipline, reinforcement of positive behaviors is very effective. Your experience as a sibling counts hugely in perpetually shaping and re-shaping your own perspectives and judgments (positive and negative) about how not to get stung in this hornet’s nest of competing interests, needs, and abilities. He glared fiercely at her, went very still for a moment, and then burst into tears –“Yea, like I have choice. I’ve adjusted every day of my life for her!” and ran outside, seeking his comfort with the presumably less judgmental barn animals. How many hours had Craig waited in waiting rooms while his sister received care? How many conversations had he overheard between his parents about her needs, compared to the ones they’d had about his? He loved her unconditionally, was incredibly proud of her, and protected her from insensitive peers. But wasn’t he entitled to think she could be a pain sometimes – just like all other sibling pairs from time immemorial? Couldn’t he not always have to try extra hard to make his parents proud of him since they worried so often about his sister? Couldn’t they talk to him about what was the matter with her and if she’d ever be normal? Let them know that you expect them to have many complicated feelings about their sibling, some loving and some not; and that you are open to listening without making them feel bad about it. They are feelings, after all, not explosives, and ambivalence is a thread woven into every relationship. Avoid setting unrealistically high standards – emotional, social, spiritual, moral, athletic or academic. They are just who they are, not compensations for who they are not. Expect them to reach their limit periodically (just like yourself), and try to avoid shaming them when they do. They need diversion and recovery time at such moments, not sermons. Guilt about ‘being normal’ is nearly universal in such children; making the sermons at such moments a kind of double-whammy of shame. Nothing is more effective than mutually gratifying time alone with you, although careful listening is its equally effective clone. As children develop, their understandings (and their worries) get more complex, so have periodic check-ins with them about their (ever-changing) questions about what is ‘the matter’ with and future for their sibling. I’m the mother of two daughters, ages seven and eight and a half, who fight constantly. My husband and I differ about how to find out who is wrong and who should be punished. Help! One of the most frustrating and least useful things to do when children are fighting is to attempt to dispense justice. Typically, older children hit harder and younger children scream louder. Older ones are more clever and devious; young ones cry foul sooner than is necessary. Boys threaten, while girls provoke more often. Trying to decide who is wrong when you weren’t there tempts children to distort the evidence. So try to catch your children being good and make a big deal out of it. Real physical or emotional abuse is pretty rare in well-functioning families but needs to be dealt with by giving children a cooling-off period – then reviewing the family rules. The Birth of a New Sibling – What to Do? ‘Me, myself and I’ – The mantra of toddler-hood reminds us that 18 to 24 months finds most kids falling short of being able to participate in the care of a younger sibling. They have just begun to take care of their own business, so looking after someone else’s (with whom you have to share mom and dad) is annoying to say the least. By 48 months: Children are able to feel some ownership of a new baby – rocking, diapering, comforting, and playing with a baby are possible, if not always high on their list of fun things to do. They own enough familial territory by now that they can afford to share. A younger sibling often adores an older sibling. Teach your older one (don’t ignore the boys) to be tender and gentle when holding or feeding the baby. This is great training for future intimacy and competent parenting. Preserve time alone with your older children several times a week. They may no longer be the ‘only,’ but they are the still the ‘first,’ and certain privileges pertain, along with new responsibilities! Don’t underestimate how your own experience as a sibling -in a particular birth order – affects your perception of your children’s experience. You may be off by a mile in your evaluation of your child’s jealousy of a new baby if you are the baby in your own family, or the first-born.Keep the dialogue open with your children about the shape of their sibling relationships and you will learn a lot.